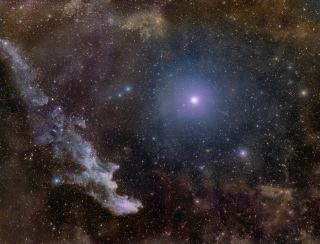 Light from the star Rigel reflects off the dust composing the Witch Head Nebula. Rigel is a blue supergiant that is the brightest star in the constellation Orion (the Hunter). Due to its measured size and brightness it is expected to end in a supernova one day. It also has two known companions, Rigel B and Rigel C.
The star is about 870 light-years from the sun and 47,000 times as luminous, according to Encyclopedia Britannica. It is a variable star (its apparent brightness varies) and is considered an Alpha Cygni-type star. Alpha Cygni is the scientific name for Deneb, the prototype star for this kind of brightness variability. Rigel's name is popular in science-fiction. It's in the name of a number of planets in the "Star Trek" universe, is mentioned in "The Hitchhiker's Guide to the Galaxy," and is also featured in a number of other novels, computer games and comic books. The name comes from an Arabic phrase, "Rijl Jauzah al Yusrā," which means, "The left leg of the Jauzah," according to Richard Hinckley Allen's book "Star Names: Their Lore and Meaning" (Dover Publications, 2013). The phrase is also sometimes translated as "The left leg of the giant," referring to the constellation Orion, which Rigel is a part of. Rigel is more properly (to astronomers) known as Beta Orionis. Rigel has two distant stellar companions, Rigel B and Rigel C — a binary system. At the ninth magnitude, the combined light of these stars would usually be enough for most telescopes to pick up, but they are too close to Rigel to be distinguished apart. Rigel's bright starlight also bounces off a nearby nebula, as shown in a picture published in 2012 on NASA's Astronomy Picture of the Day website. "The blue color of the Witch Head Nebula and of the dust surrounding Rigel is caused not only by Rigel's intense blue starlight, but because the dust grains scatter blue light more efficiently than red," NASA wrote. "The same physical process causes Earth's daytime sky to appear blue, although the scatterers in Earth's atmosphere are molecules of nitrogen and oxygen." Astronomers have made several observations of Rigel in recent years. For example, a 2014 study examined the variability of stellar winds coming from Rigel over several years. The astronomers noted that the observations were made in high spatial and spectral resolution. And, a 2017 study measured the stellar flux density of Rigel and two other stars, Aldebaran and Fomalhaut. Stellar flux refers to how much radiation energy a star emits. In general, the group found that stellar flux density is at a minimum at the outer surface of a star and at a maximum inside of the star. Due to its proximity, Rigel is also used as an example of how massive stars may evolve, as discussed in a 2013 review published by the European Astronomical Society, and a 2014 study published in the Proceedings of the International Astronomical Union. Find out How the Night Sky Constellations Got Their Names. Learn why astrology is not a science. Check out NASA's star image gallery at Hubblesite.